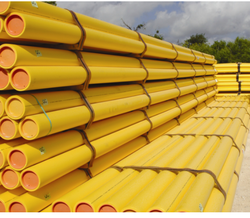 Our range of products include gas pipes. Sangir's Gas Pipes have high chemical and temperature resistance. The pipes are leak proof and flexible. This makes the pipes highly demanded. The pipes are absolutely safe to use and the installation is also very easily done. Packaging Details: Bundles or customised as per customer requirement. Looking for PE Pipes ?